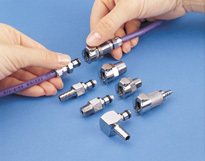 FT-MC Series couplings offer 1/8" flow with the durability and attractiveness of chrome-plated brass. They provide excellent service at high pressures. 3/16" ID Hose Barb; Shutoff Panel Mount Insert 1/8"
참고: PTF fittings are designed for semi-rigid tubing i.e.polyethylene, nylon, etc., and polyurethane tubing.